In 1963 the first Seiko Sportsmatic Five model was launched. The watch was designed to be a cost effective versatile everyday device that could handle a wide variety of different situations and environments. This line of watches is arguably Seiko’s most successful and has become synonymous with rugged,reliable, affordable mechanical watches. This series continues to be produced today. The 5 has been tied to five key features that the watch possess. Seiko list these as the following on current official company sites. People may be surprised that when launched in 1963 these were not exactly the same five key features that were identified by Seiko for the Five. The first three items listed today do match the initial key features. Efficient automatic winding was a function that utilised Seiko’s “magic lever” mechanism and in the early 60’s was a function that most affordable watches still lacked. The ability to easily view both day and date on a watch was also something that was not present on all watches with this been seen as a more premium feature as opposed to just a stylistic choice. The day and date were often separated on the dial, so customers would have appreciated the clean layout on the Five with both indicators presented together and at the same level. Water resistance was another relatively new function that was rapidly growing in popularity as people had more active leisure time spent outdoors. The fourth item listed is a “Design with masculine charm” this is a general design philosophy and not specific to a recessed crown at 4’ o’clock. The use of the recessed crown was a common design element for Seiko automatic models to show that the watch did not need to be adjusted or wound regularly. It was not limited to the Five series as prior to its launch this was commonly used on various Sportsmatic and Seikomatic models. The last of the five features was the reasonable use of jewels in the movement design. The watch was equipped with a 21 jewel movement and this utilised three jewels specifically for the calendar mechanism. By providing a reasonably jeweled mechanism there was no waste of resources but it still allowed for a robust and low maintenance design that would perform well for years to come. 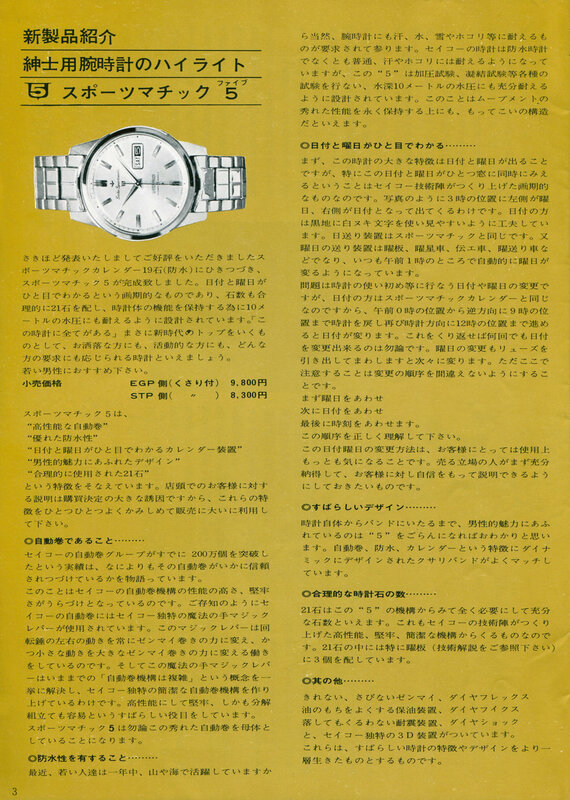 Below is a general translation of the original Sportsmatic Five product announcement that appeared in the September 1963 issue of Seiko News. Sportsmatic 5 has been completed, following the Sportsmatic Calendar 19 jewel (waterproofing) which was announced earlier and was well received. When the date and day of the week are known at a glance, a reasonable number of jewels and a case designed to withstand water pressure of 10 meters in order to keep the functionality of the watch. "There is everything on this watch." As a leading design of the new era, it is a watch that can be used for anyone who is fashionable, active, or any other type of request. Please recommend it to young men. Since the explanation to the customer at the shop front is a big incentive of purchasing decision, please use these features carefully one by one and use it for sales to a large extent. Seiko's automatic winding system already has exceeded 2 million pieces, which shows how reliable the automatic winding is more than anything else available. This is ensured by the high performance and robustness of the automatic winding mechanism of Seiko. As you know, Seiko's unique magic lever is used for Seiko's automatic winding. This magic lever works to change the left and right movement of the rotary weight constantly to wind the mainspring and to change the small movement to the force of the large spring winding. This magic lever solves the concept of "the automatic winding mechanism is complicated" up to now, and has created a simple self-winding mechanism unique to Seiko. It has a wonderful design being high in performance, robust, and easy to disassemble and assemble. Of course Sportsmatic 5 will be based on this excellent automatic winding. Recently young people are active in the mountains and seas all year round. Of course, wristwatches are required to withstand sweat, water, snow and dust etc. Although Seiko's watch is not necessarily a waterproof watch, it usually comes to be able to withstand sweat and dust, but this 5 is designed to withstand various tests such as a pressure test enough for water pressure of 10 meters depth. This can be said to be a perfect structure for keeping outstanding performance of the movement for a long time. First of all, the big feature of this watch is that the date and the day of week are displayed, but in particular that this date and day of the week can be seen at the same level in the window. It is an epoch-making design that the Seiko technical team has created. As shown in the photo, the day of the week is in the left of the 3 o'clock position, and the date in a position on the right. The date is devised to make it easy to see by using white characters on a black background. The date advancing mechanism is the same as the Sportsmatic. The calendar advancing mechanism of the day of the week is made up of the day board, the day star, the date wheel, the day feeding, etc. The day of the week is changed automatically at 1 o'clock in the morning. The problem is to change to the correct date and the day of the week at the beginning of the use of the watch, but since the date is the same as the Sportsmatic calendar, return the watch to the position of 9 o’clock in the opposite direction from the position at midnight and turn again in the clockwise direction of 2 o’clock. The date will change as you advance to the top. Of course, you can change the date as many times as you repeat this. Changing the day of the week will change one after another as you draw out the crown. The only thing to note here is to avoid mistaking the order of change. First set the day of the week. Please understand this order correctly. How to change this day of the week is the main concern for customers. A salesperson will be able to explain the process confidently to customers and allow them to purchase it. From watch to the band, I think that it is obvious, if you see "5" it is overflowing with masculine charm. Self-winding, waterproof, calendar features are well matched to a dynamically designed metal bracelet. 21 jewels is enough to be required in the design of this "5" mechanism. This comes from the high-performance, robust and simple mechanism that Seiko's technical team constructed. The 21 jewels includes three pieces specifically on the day mechanism (please refer to the technical explanation). Diaflex: the unbreakable mainspring material that does not rust. Diafix: a feature that ensures that oils are kept in key areas. Diashock: shock protection that protects the watch if dropped. Seiko’s unique special 3D features are implemented. These are wonderful watch features and practical designs for everyday use.